The gel is used topically on wounds and burns to help them heal more rapidly. Taken internally, it is considered a general tonic. Unfortunately, separation of the gel from the latex for commercial preparations is often incomplete, and the gel may end up with some laxative action due to inadvertent inclusion of latex. Aloe has been recommended for burns due to radiation, but like most of its uses, this is considered incompletely proved and controversial. There is no harm in applying fresh gel from a broken leaf to a minor cut or burn, and many people find it soothing. In the test tube, gels from some species of aloe have antibacterial activity. A. vera, however, does not appear to kill many microbes. The latex of Aloe is a powerful laxative that irritates the intestine. We do not recommend using this product internally. There are nearly five hundred species of aloe. It’s a type of plant that originated in southern Africa, near the Cape of Good Hope. The use of aloe goes back in history 5,500 years. There are pictures of aloe plants on some Egyptian temples. The Greek physician Dioscorides wrote of its benefits to heal wounds and treat hemorrhoids. Aloe plants now grow throughout Africa, around the Mediterranean and the Caribbean, and in many countries in South America. Pregnant women must avoid aloe latex; use has been known to trigger abortion or premature birth. Nursing mothers should take this laxative only under medical supervision. Children must not take aloe latex. Women who are menstruating should not use aloe latex, as it may increase blood flow. Aloe latex may be very dangerous when there is an intestinal blockage and must be avoided in such cases. Aloe latex is not appropriate for people with intestinal inflammation such as ulcerative colitis or Crohn’s disease, and it should not be taken by people with inflamed hemorrhoids. People with kidney problems should avoid aloe latex. The most serious difficulties encountered with aloe latex occur at higher than recommended doses or when used for more than a few days. This laxative herb causes the loss of potassium and other minerals, which over time can result in a loss of muscle tone of the intestine and diminished effectiveness. Frequent use may cause irreversible damage. 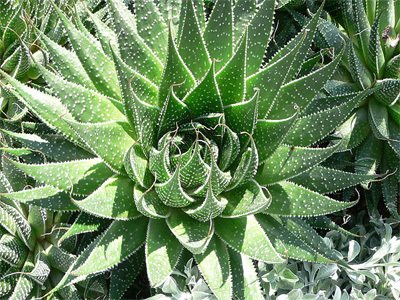 Large doses of aloe have caused bloody diarrhea, kidney damage, and even death. The urine may take on a reddish color after taking aloe latex. This color is harmless; however, with the possibility of kidney damage from large doses or prolonged use, any persistent color in the urine may call for medical diagnosis. Possible Interactions: Low potassium levels can be dangerous in a person taking a heart drug like Lanoxin. Aloe latex might also be dangerous for anyone taking a diuretic that depletes the body of potassium (Lasix, HCTZ, etc.) because of the additive effect. It should be avoided in such situations. Aloe latex could reduce the absorption of any pill taken around the same time because it cuts intestinal transit time so drastically.